Most guests are still shunning self-service options when checking in and out. 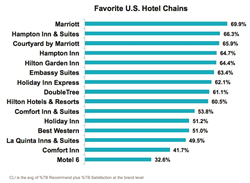 According to a large-scale consumer study conducted by Market Force Information® (Market Force), a leader in customer experience management, Marriott is consumers’ favorite brand among major hotel and motel chains. The study also found that, while many are using mobile apps to find and book hotels, newer technologies such as check-in kiosks aren’t yet enjoying the same level of success. More than 9,000 consumers were polled for the study, which was designed to uncover which hotel and motel brands are excelling, competitive differentiators, hospitality technology usage and satisfaction with the hotel experience, among other insights. For the rankings, Market Force asked participants to rate their customer satisfaction with their most recent hotel or motel stay, as well as their likelihood to refer that brand to others. The results were averaged to attain a score on the Composite Loyalty Index. Marriott ranked No. 1 with a 70% score, Hampton Inn & Suites and Courtyard by Marriott tied for second with 66%, and Hampton Inn, Hilton Garden Inn and Embassy Suites rounded out the top five. [See Graph 1]. The top nine brands were tightly clustered on the Index, underscoring the competitive environment and showcasing a need to differentiate. Market Force also looked at how the top hotel chains fared in areas such as service, room condition and value. Hampton Inn dominated in all of the service areas, earning top marks for ease of check-in, staff friendliness and helpfulness. Marriott led in the room-related categories, ranking highest for its bed and bedding, bathroom and carpet condition, in-room entertainment and temperature and noise levels. Courtyard by Marriott was the value leader, and scored in the top five for most of the room attributes. Hilton Garden Inn has the most attractive rooms and was second for value. [See Graphs 2 and 3]. Hampton Inn is also winning with its rewards program, with 72% indicating that they’re members. 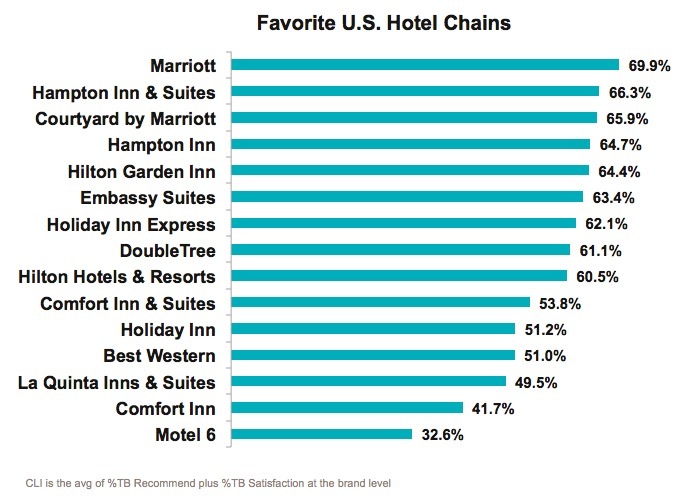 Marriott and Hilton Hotels & Resorts tied for the second-highest number, while Comfort Inn and Best Western had the fewest. Nearly half – 44% – of those surveyed said they have used a mobile app to find or book a hotel, and the usage was similar across younger and older generations. Most are using the apps to compare prices, book rooms, view availability and search by location. Conversely, few are using them for tasks such as setting price alerts, checking a location’s policy or writing a guest review. 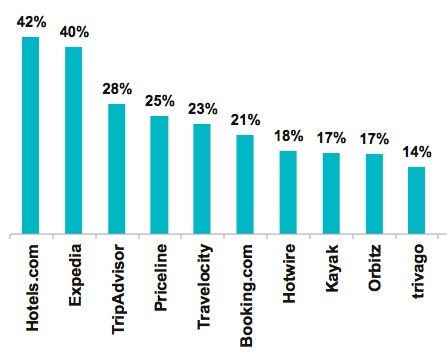 Hotels.com and Expedia are far and away the most popular hotel apps, followed by TripAdvisor, Priceline and Travelocity. [See Graph 4]. When it comes to checking into a hotel or motel, most guests head straight for the front desk. Market Force found 93% are still checking in with reception. Just 3% report checking in online, 2% through an app, and a mere 1% at a self-service kiosk. Seventy-one percent of those who checked in at the desk had an efficient experience, compared to 59% of kiosk users. [See Graph 5]. The numbers were similar for checking out – 71% checked out at the desk, 22% left the key in the room and only 2% visited a kiosk. 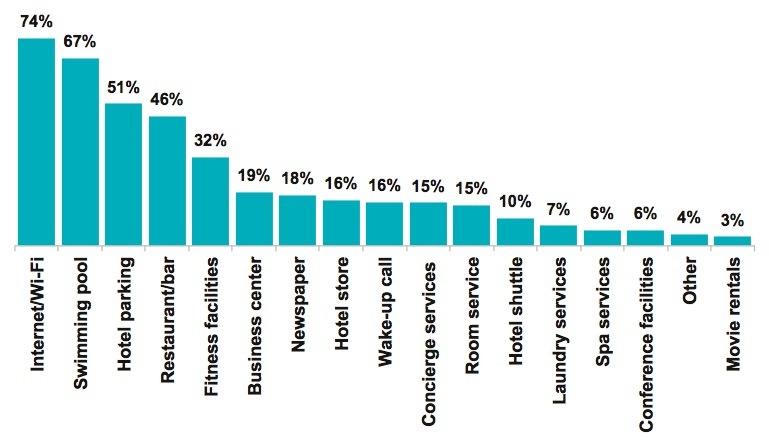 Are Guests Using Amenities and Grabbing Breakfast? More than one-third of hotel guests reported dissatisfaction with the Wi-Fi experience during their recent hotel or motel stay, and that could be because it’s the amenity they used most. Market Force found that half had used an amenity or facility during their stay – 74% used the Internet, 67% swam in the pool, 51% parked at the hotel and 46% visited a restaurant or bar. The least used were the movie rentals, conference room and spa. [See Graph 6]. Two-thirds had breakfast at their hotel or motel, and it was an included perk for 83% of those. The highest levels of satisfaction came from those with a hot buffet and custom omelets, and the least satisfied were those who offered a continental breakfast. Embassy Suites and Hilton Garden Inn earned the highest scores for breakfast satisfaction. The survey was conducted online in June 2016 across the United States. The pool of 9,167 respondents represented a cross-section of the four U.S. census regions, and reflected a broad spectrum of income levels, with 61% reporting household incomes of more than $50,000 a year. Respondents’ ages ranged from 18 to over 65. Approximately 75% were women and 25% were men.